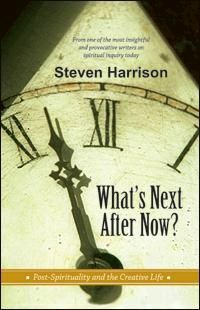 STONE HILL FOUNDATION PUBLISHING - Wha's Next After Now? Limited imported copies of the following books by Steven Harrison are available directly from Stone Hill Foundation Publishing: Doing Nothing (Rs. 350, hardbound, published by Tarcher/Putnam); The Happy Child (Rs. 225, paperback, published by Sentient Publications). Also available directly are the following Steven Harrison audio/video material: Are We Aware Yet? : Dialogue with Steven Harrison (70-minute single audio cassette of talks and dialogues); Beyond Consciousness: Ordinary Spirituality (a 3-hour set of two audio cassettes containing dialogues); Self-Deception and the Fires of Transformation (a set of 4 audio CDs, duration 4 hours 56 minutes, containing dialogues); The Human Potential: Living in the Quantum Reality (80-moiute VHS videotape of a dialogue) by German viseographer Niket Scherer; Just As It Is: Conversations with a Contemporary Mystic (107-minute VHS videotape of conversations and dialogues); in cinema-verité style by Nick Scherer.